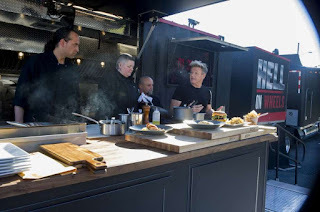 In this 24 Hours to Hell and Back episode, Gordon Ramsay visits Vasi's Restaurant and Bar in Waterbury, Connecticut owned by Vasi. His parents opened a number of restaurants when they came to the country from Greece and in 2002 Vasi decided to open his own restaurant and bar. His father sadly passed away in 2008, they are $500,000 in debt and will be forced to close in a few months. Gordon appears undercover wearing a beard and a wig. He doesn't like the decor and is confused by the menu, a French onion soup has no place in an Italian restaurant. Gordon orders some staple dishes including calamari, shrimp and clams. The calamari tastes like rubber and is old, the shrimp is sour and rancid and the clams are rotten, overall the food is terrible. Gordon goes to the bathroom and removes his disguise. He goes into the kitchen and gets the staff to come out into the dining room. Chef Val reacts badly to seeing Gordon in the restaurant but Gordon reassures her that he knows she can cook and isn't there to put her down. She agrees to stay and Vasi calls his mother Toula over to meet Gordon. Vasi blames tough times on the failure of the restaurant and Val blames the boring menu that she isn't allowed to change. Gordon asks all of the staff and customers to come outside to see his Hell on Wheels truck. They watch hidden footage of the restaurant including Vasi being abusive to staff, frozen produce, fruit flies and rotten food. There are lapses in food hygiene as Val is shown to dip her fingers into food and lick them and another chef drops food on the floor that is served to a customer. Vasi doesn't react to the footage, Gordon questions him and he says that he is tired. Gordon talks to Val about the menu and she says she hates the menu whilst Vasi denies knowing she felt this way. Gordon also speaks to Toula as he feels she had a part to play in the restaurant failing and she reveals that Vasi owes her $250,000. Gordon meets with the design team to see their plans for the dining room. Next he meets with Vasi's wife Lauren to find out how he can get through to Vasi. She hates the effect that the restaurant has on Toula and that Vasi isn't happy with the restaurant. The only happiness she feels he has is with the children. Gordon goes back into the kitchen where he finds dead shellfish. Val tries to tell Vasi that it can't be used but he doesn't listen. Val gets fed up and leaves again but Gordon knows that they cannot do this without her. Vasi sits with Val in her car and apologises for everything. Val goes to the Hell on Wheels truck to learn the new food and Gordon hopes she will rediscover her passion for cooking. Gordon introduces the new menu that will have a Greek influence and he asks Val to come up with a dish of her own for relaunch. Vasi is angry at Gordon and Gordon tells him to stop being in denial about the restaurant. Gordon speaks with Toula and asks her to stop giving Vasi money as it will force him to step up. Val has mastered the new menu dishes and trains cook Jonathan on the new menu. Gordon gives Vasi a pep talk and tells him that he has to let go of the past and rebuild the business. Gordon shows Val the new equipment in the kitchen and the newly renovated dining room is shown to the staff. Both Vasi and Toula become emotional at the personal photos of the family that have been introduced. Gordon tastes Val's dish and encourages all of the staff to try it as it is delicious. For relaunch night, there is a food blogger and critic in the restaurant. Val shines in the kitchen but Jonathon struggles and shuts down slowing down the food leaving the kitchen. Vasi steps up and takes control of the kitchen, even taking food out to customers and the kitchen begins to recover. The relaunch overall was a success and the customers loved the new decor and food. What Happened Next at Vasi's Restaurant and Bar? Three months later, Vasi says customers love the new concept, he is getting on better with Val, is grateful for Gordon's help and he has lost 30lbs. Reviews are mostly positive since Gordon visited with a few negative comments about not being greeted and issued with service. Vasi's Restaurant and Bar was aired on January 16 2019, the episode was filmed in October 2018 and is 24 Hours to Hell & Back season 2 episode 3.